UK: Electricity is now being transmitted from Dong Energy's Walney Extension project in the Irish Sea. Installation of the first of 40 MHI Vestas V164-8.0MW turbines — uprated to 8.25MW — has now been completed. Work is now starting on the installation of a further 47 7MW Siemens Gamesa turbines. 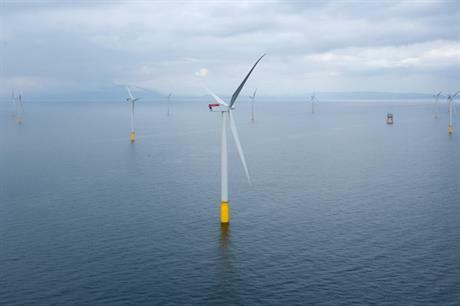 When fully commissioned, the 659MW project will leapfrog the 630MW London Array as the world's largest offshore wind development. Andrew Cotterell, Dong's Walney Extension programme director, said: "We are delighted to have passed such an important milestone for the project."